Ingredients: Aqua (Water), Rosa Damascena Flower Water, Aloe Barbadensis Leaf Juice, Oryza Sativa (Rice) Germ Oil, Aqua, Glycerin, Panicum Miliaceum (Millet) Seed Extract, Tannic Acid, Cetearyl Olivate, Sorbitan Olivate, Cetearyl Alcohol, Butyrospermum Parkii (Shea) Butter, Vaccinium Macrocarpon (Cranberry) Fruit Extract, Microcrystalline Cellulose, Cellulose Gum, Algae Extract, Potassium Sorbate, Sodium Benzoate, Cetearyl Octanoate, Prunus Armeniaca (Apricot) Kernel Oil , Dipalmitoyl Hydroxyproline, Fragaria Ananassa (Strawberry) Seed Oil, Sodium Hyaluronate, Ethylhexyl Palmitate, Tribehenin, Sorbitan Isostearate, Palmitoyl Oligopeptide, Ximenia Americana Seed Oil, Rosa Canina Fruit Oil , Boswellia Serrata Extract, Mel (Honey) Extract, Rosa Centifolia (Rose) Oil, Boswellia Carterii (Frankincense) Oil, Santalum Spicatum (Australian Sandalwood) Oil, Pogostemon Cablin (Patchouli) Oil , Pelargonium Capitatum (Geranium) Oil, Commiphora Myrrha (Myrrh) Oil, Parfum** , Xanthan Gum, Tocopherol, Phenoxyethanol, Benzyl Alcohol, Sodium Citrate, Benzyl Salicylate*, Geraniol*, Benzyl Benzoate*, Citronellol*, Farnesol*, Limonene*, Linalool*. 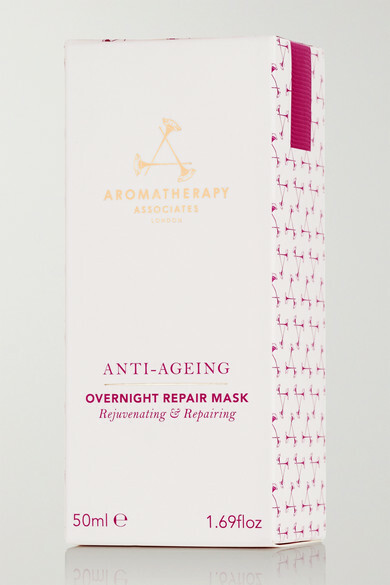 Aromatherapy Associates' 'Overnight Repair Mask' is an intensive rejuvenating treatment that you can wear whilst you sleep. It's formulated with fatty acid-rich Strawberry Seed Extract to plump skin and restore moisture, as well as nourishing Rice Germ and Millet Seed to protect against the damaging effects of pollution.